Today we went to the shelter home at Kissi Town. Our first leg was to walk down to Congo Cross, a crazy junction where accidents should really be happening more frequently. Drivers here have mastered the art of squeezing through the tiniest of spaces. On our first poda-poda (a mini van that jams as many people as possible), I sat in the front passenger seat and Ashley in the middle. The right side mirror hit a school boy in the back of the head as we were passing and he rubbed the spot in patient resignation. 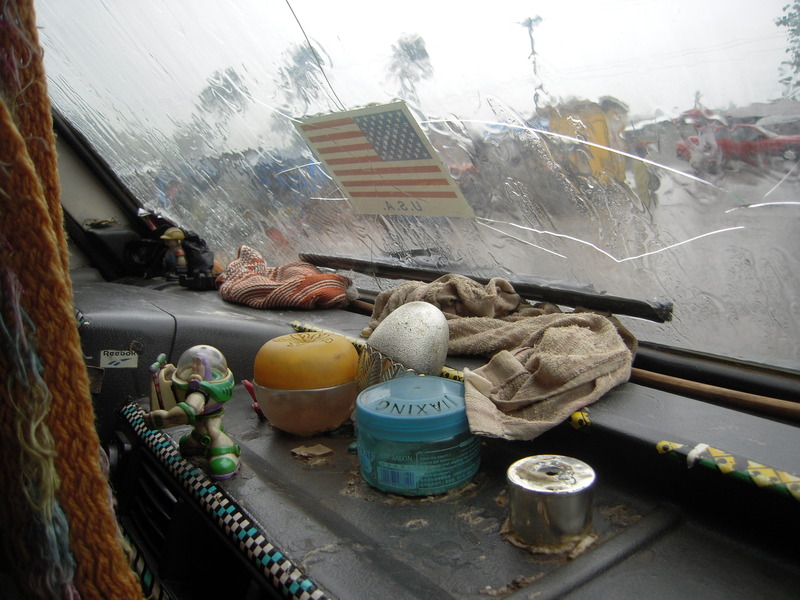 You catch hundreds of small human vignettes as you pass through Freetown. Between two parked cars a woman picks her toes. On a second floor balcony a young girl twirls like a ballerina. A frighteningly old man slaps his knee, his laughter drowned out by the defeaning noises of the city. Stacks of fake Levi’s. A store that sells nothing but PVC piping. A woman lounging against a mangled building, lazily inspecting her breasts. How people in Freetown manage to live and survive in such close quarters is truly amazing. Our second leg of the trip was another poda-poda, this time to Waterloo, a roadside town an hour outside Freetown. The driver passed Waterloo Junction, so we had to backtrack our steps through a downpour. We were in the rain no more than a minute and we were soaked through. Several okata (motorcycle taxi) drivers beckoned us to sit under their cover and alternated between staring at us and being engrossed in the happenings all around. After our third poda-poda trip, we arrived at Kissi Town. Revered Spencer’s face was all smiles when we saw him. We greeted the Reverend’s wife, Theresa, several teachers and students, and sat down to a discussion about the school and farm progress. Reverend Spencer shoulted out the window and across a field at some students to bring him his glasses, the sure sign that he was ready to get down to business. We discussed logistics in preparing for installation of bunkbeds and the completion of a small building that will, hopefully, be the girls’ new home. The farm continues to do well. A few more acres have been cleared and students visit the farm every other weekend to work. My jaw dropped when I saw the site. 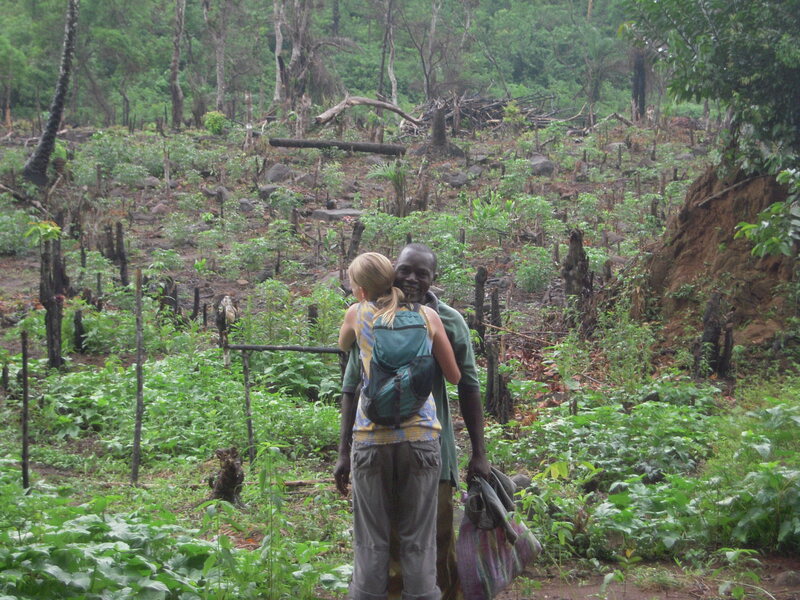 10 months ago Reverend Spencer had hacked his way through a jungle and when we reached a small clearing said, “Okay, this will be the farm.” My skepticism ran high at the time and now I was humbled by an enormous swath of land that had been cleared by hand. Hundreds of groundnut (looks like peanuts) plants, cassava, eggplant, pepper, potato leaf, and corn as crops, all of which that can be sold locally. The rain picked up its usual pounding and we stood under a tree looking out at the acreage. At the far edge of the field we could see two figures approaching. 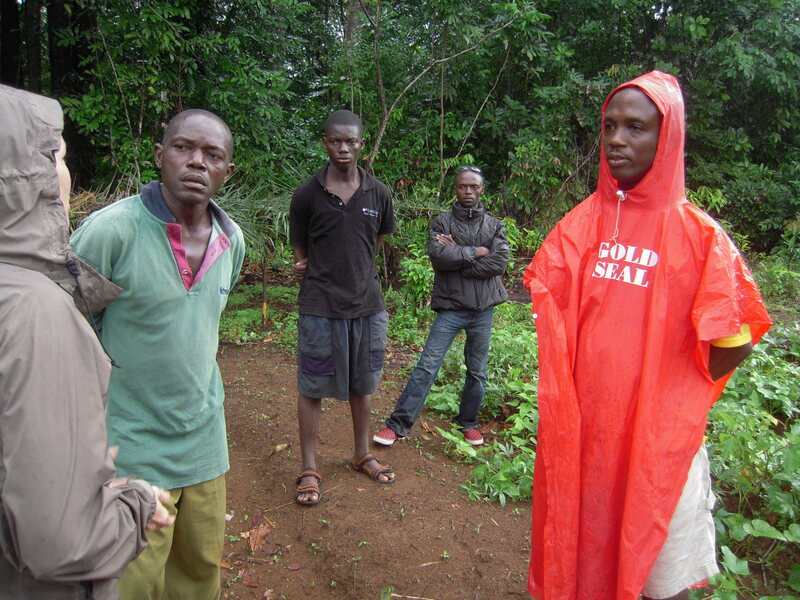 Reverend was quick to tell us it was Abdul and Pa Sesay, the two main laborers for the farm. They picked their way across the field, looking side to side as if doing a last-minute inspection, and greeted us with weathered, toothy grins. In the farm pics here you’ll see a bunch of sticks poking up through the ground. Bizarre looking, but that’s the way they do it here: too difficult to tear them from the soil completely; also, the remaining trunks provide extra protection against erosion. We left the farm a while later and headed back through the jungle to the main road, Reverend jumped off at Kissi Town and we continued on for 10 miles on okatas, luckily with no rain. The fog clawed its way over the mountains on the left and on the right the Atlantic waters seeped into low lying rice fields and palm trees. 2.5 hours later we were slogging our way up a hill to our home, kids yelling in glee and playing soccer barefoot on shards of glass and broken concrete. I adore each picture, so moving and important, thanks!